When last we left the intrepid Ghostbusters of the Fargo franchise, they had attempted to drum up some business with a publicity stunt on the outskirts Bemidji, Minnesota. 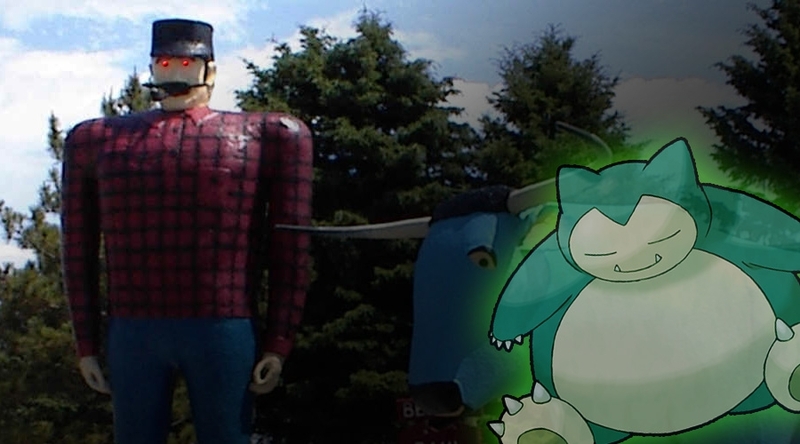 Their efforts to rid the novelty Paul Bunyan gift shop of ghost miners has unleashed a malignant ghost entity that has possessed the statue of the giant lumberjack. Can former Spetsnaz commando Alexei “Eric” Dragomirov and physics professor Aldo Dunkheimer regroup and bust that big ghost? 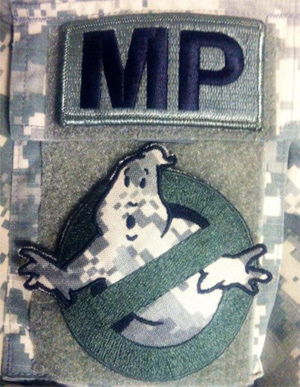 Or will the Fargo Ghostbusters just say “aw, jeez” and call it a day? Find out! Zack: Just to bring you up to speed, the gift shop has been obliterated, DUCK-1 has been flipped onto its side, and the giant ghost heart of industry has possessed a 40-foot statue of Paul Bunyan. Zack: He’s headed in the direction of the nearby town of Bemidji. Steve: I’m no Ghostbusterologist, but if we’re going by standard Ghostbusting escalation procedure, we’ve gotta find something else giant to fight the possessed Paul Bunyan. Zack: Babe the Blue Ox has been damaged by Paul Bunyan as he was leaving. Steve: Maybe like one of those outdoor McDonaldlands? We could get inside the Grimace and make it come to life. Zack: They stopped having those like 20 years ago. 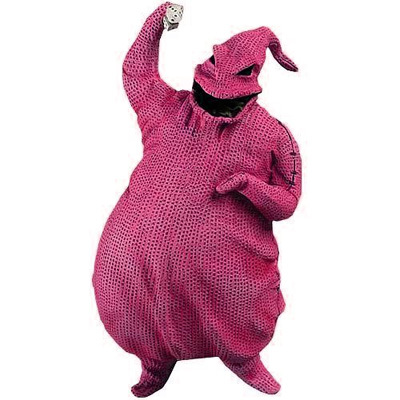 Also the image of a Grimace coming to life with people inside it is too horrible for a Ghostbusters movie. 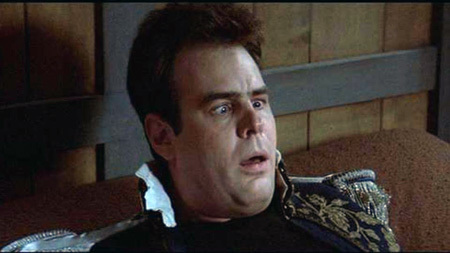 Steve: Worse than Dan Aykroyd’s ghost BJ face? Zack: Even if you had a viable Grimace, how are you going to bring it to life? Zack: As if on cue, you hear a loud snoring from the overturned DUCK-1. Zack: “No time for that, Eric! Quickly, lure him out with this neck pillow.” He hands you a sweat-stained neck pillow you’ve seen him using while chair sleeping back at your log cabin HQ. Zack: A glowing pillow man snorts as his snoring is interrupted. He comes floating out of the car, looks at you, and yawns with a mouth that stretches almost big enough to swallow you. Zack: He eats the pillow out of your hands, leaving your arm covered in ectoplasm. He starts to slide back into the overturned DUCK-1. Zack: Before you can reply, you hear a car crash and glass breaking along with screams. It is followed by another crash and an unearthly bellow the sounds through night. Zack: “Waaa wwwaaa wa,” says Sleeper rubbing his eyes with his pillow-like hands. Zack: That’s not something that actually exists. Steve: Sleeper doesn’t know that. Zack: “Waaaaaaaa!” Sleeper lets out a big yawn. Steve: That had better mean he’s ready for action. 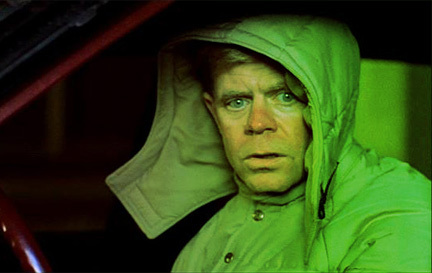 We’re going into Bemidji and we are going to find him a giant body to possess. Zack: How are you going to get into town? Steve: Ask this gas station guy if he has a tow truck we can borrow. Zack: He looks at you with confusion and then looks at Professor Dunkheimer. Steve: Also did he not notice the ghost with us? Or the giant one that exploded his gift shop? Steve: While these two are talking I am gathering up guns and RPGs and grenades out of the DUCK-1 until I am strapped up Commando style. Zack: “So where are you fellas located out of anyway?” asks the gas station owner. Zack: You hear a loud explosion and a ball of fire and smoke goes curling up into the air a couple miles away in Bemidji. Zack: “No problem, at all,” says Professor Dunkheimer. Steve: Oh, no, they’re going to get going again. I’m getting in the tow truck and honking the horn until Professor Dunkheimer and Sleeper get in with me. Zack: You drive past a trail of destruction as you head into Bemidji. The quaint town has obviously been stomped through by the possessed Paul Bunyan. Nobody seems to be seriously injured, although there are a fair number of overturned cars and trees knocked into houses. Steve: Do we see Bunyan? Zack: That bustin’ would not feel too good. Steve: Is there a way for me to drive the tow truck around to get ahead of the giant Paul Bunyan? Zack: Moves and Drive Vehicle? Steve: I have Moves at 4 but I picked Fire Weapon as my main Talent. Drive Vehicle is at 1. Zack: Okay, roll 5 dice. Your target number is 20. Zack: You’re going to fail horribly unless you spend serious Brownie Points. Like 6 of them. Zack: You crash the tow truck through someone’s hard, into a barn and out the other end of the barn with a fence covering the windshield. 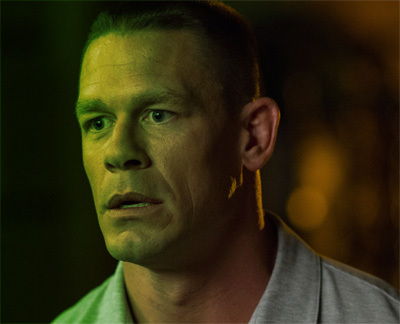 You hear cars honking and lights flash past you, but you can’t see anything. There’s a chicken in the truck somehow. Just as you manage to reach out the window and yank the fence off your windshield, you realize you’re about to hit a huge truck. You yank the wheel to the side, drive down a steep embankment, up the other side, crash through someone’s garden and come out ahead of the Paul Bunyan. In fact, you’re right by the Muffler Man Indian, which is a 20 foot tall Indian that looks like it’s either waving or doing the Nazi salute. Steve: Pulling up to it and jumping out of the tow truck. Steve: Is that an affirmative “WAAAH” or a negative “WAAAAH” sound? Zack: He is flying into the Indian, but he doesn’t look eager to fight. He looks afraid. 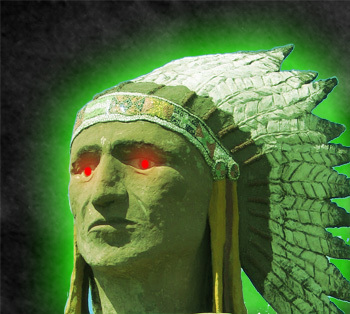 Zack: The Muffler Man Indian begins to emit a green glow and its eyes glow red. Its feet break free of the base it is standing on and it walks out into the street. Zack: And starts to awkwardly run away, overturning a car and smashing a shop window for Ned’s Typewriter Repair in the process. 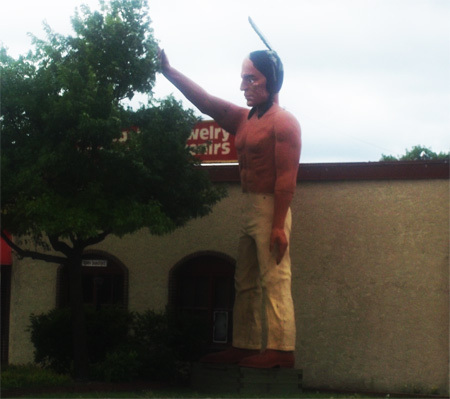 Zack: “WWAAAAAAAAAAAAAAH!” yawns the giant Indian mightily. Zack: “Oh, for Pete’s sake,” says Professor Dunkheimer. Steve: Does it seem like I am going to be able to catch Sleeper in the giant Indian? Zack: Maybe. He isn’t too fast and is pretty awkward. Lots of tripping over trees and parked cars. Unfortunately, the ghostly heart of industry is much faster and will be in downtown in a hurry. Zack: He hands over his proton pack. Steve: I set his pack and mine at my feet. Then I pick up two machine guns and stand in the middle of the street waiting for this ghost to get over here. Zack: It doesn’t take long. The red-eyed Paul Bunyan lumbers over buildings and smashes a police car out of its way. It stops when it sees you standing in the road and it brandishes its enormous ax. Zack: The Paul Bunyan roars with spectral fury and raises its glowing green ax above its head. Steve: Lighting it up with every bullet and grenade I have. Zack: You blaze machine guns at Paul Bunyan, blowing off chunks of wood and plastic. One of his arms is blown off and his ax goes flying and smashes into a giant donut on top of a donut shop. Steve: Should have had Sleeper possess that. Zack: Your ammo runs out and your last grenade has exploded. Paul Bunyan is a bullet-riddled wreck with his head and chest blown wide open. This damage exposes a glowing green humanoid body inside him. It pulses with malevolent unlife, the huge heart beating inside its chest. Zack: To your surprise the Paul Bunyan ignores you. It walks over to its huge ax and picks that up, then it starts walking back towards the center of town. Zack: You finally realize where it is going: there is a huge oak tree near the center of town. It’s going to try to cut the tree down. Steve: Deforestation is one of the leading causes of global warming. Also this ghost might not be aware of the many conservation laws passed in the US since he died. Zack: Not a dead person, the heart is a manifestation of psychic energy. 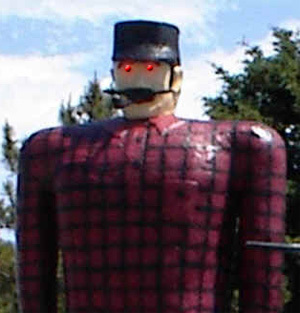 Steve: Wait a second, the giant Paul Bunyan is made out of wood and plastic, right? Steve: So can he actually cut down this big tree? Zack: You watch as he swings and the blade of his ax smashes against the tree. It breaks open and like a wrapper on a rotten cadbury egg it reveals a glowing green ax beneath. This chops a notch out of the tree’s massive trunk. Steve: I have only one choice left. I’ve got to use both proton packs. I’ve got to dual weild these bad buys. 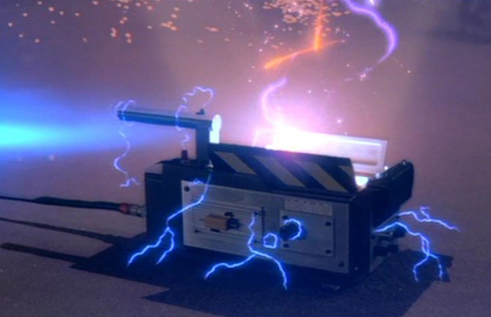 Zack: Alright, even though it specifically says it requires at least two ghostbusters to try to contain a spirit with proton packs, I am going to let you try. Target number is going to be 60. Steve: I have 8 dice. That’s not possible. Zack: I’ll let you add 10 to your roll for every brownie point you spend. Steve: I only have two of those left. Zack: Better spend them both. Steve: Fine. 20 from the brownie points plus. Zack: You heroically blast the giant Bunyan with both proton packs. You wrestle the twin particle streams onto the pulsing heart of the ghost. You cage it in pure writhing protonic energy and begin to draw it out of the Bunyan statue. With a last effort you pull it competely out and the ghostly green heart beats wildly in the streams of your proton guns. Zack: And then you cross the streams. Zack: The packs blow out and you are flung through the air and into a nearby custom stool shop, where you crash painfully into a bunch of unfinished stools. The ghostly heart is frozen for a moment, seeming to fade out. It begins to beat again and sprouts spectral tendrils that pull it back towards the smoking husk of the Bunyan. Steve: I have to stop it. Maybe I can trap it before it gets back into the Bunyan. Zack: You’re hurt pretty badly and tangled up in about 50 stools. Zack: Your struggle to get out of the stool pile and stagger into the street is mirrored by the ghost heart’s struggle to pull itself over the debris-strewn street and crawl back into the mutilated Bunyan. Zack: The heart roars and moves faster as you stumble after it, a ghost trap dangling in your grasp. You don’t think you can keep up with it. Your legs are giving out. Steve: I crawl if I have to. Zack: You’re crawling after it as it starts to pull itself into the Bunyan like a big evil frog into a kicked pumpkin. Zack: “WAAAAAAAAAAAAAAAAAAAAAAAAA!” A ghostly bellow from above startles you. A massive Indian steps over your body and, with one hand seeming to “Heil Hitler” it scoops up the ghostly mass of the heart. Steve: “Sleeper!” I am opening the ghost trap. Zack: Your trap flickers open and a cone of energy projects above it. The Sleeper-possessed Indian slams the heart down into the trap like somebody trying to get a spider off a broom. The heart thumps one last time as it is sucked into the trap. Zack: The trap closes and sits smoking on the ground. Zack: All around you, cars are overturned, store fronts are smashed, and trees have been uprooted. Steve: But not the big oak tree? Zack: No, other than a notch from one chop it is fine. Zack: Dozens of sirens sound in the distance as police from every nearby town drive towards Bemidji. Sleeper leaves the giant Indian and disappears into a partially collapsed mattress store. His snoring echoes into the streets. Steve: Yeah, I think this will work as a publicity stunt. Steve: I take it nobody paid us for busting that ghost. Zack: No, but several dozen people are threatening a very polite, almost apologetic class action lawsuit. Zack: I don’t think that’s the right moral to take away from this adventure. Steve: We should have let the ladies handle the Ghostbustering? Zack: Sure, let’s go with that one!